Born in Andrews, South Carolina, Dr. James H. Cokley, is a graduate of Andrew High School where he achieved a number of firsts. He was the first African-American male to graduate as Valedictorian, the first Black Eagle Scout of Georgetown County, and the first Black member of the Order of the Arrow, a program for honor scouts. University of South Carolina, SC (1982). He has pastored three churches including the Cherry Hill Missionary Baptist Church, Conway, SC where he has served for the last seventeen years. He has been devoted to Christian Education in his home state of South Carolina, having served as a Faculty member, Assistant Dean, Dean, Vice-President and President of the South Carolina Baptist Congress of Christian Education. 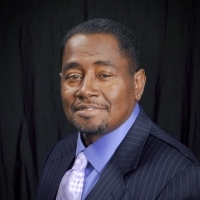 On the national level, he has actively served in the leadership of the National Baptist Congress of Christian Education since entering the Dean’s Office in June 1987 as a Dean’s Specialist. Within his tenure, he has served as Special Assistant to the Dean, Assistant Dean, Regional Vice President, Vice- President at Large and now as President. He takes very seriously his appointment to the Presidency of the National Congress and vows to follow the leadership of Dr. Jerry Young, President of the National Baptist Convention, USA, Inc. and to lead the Congress to Envision the Future Exceptionally as we strive to make disciples for Christ of all who accept Jesus Christ as Lord. The Reverend James H. Cokley is married to the former Cindy Graham of Conway and they are the proud parents of three children, two daughters and one son, and one foster daughter, two grandchildren and two foster-grands.